If all recreational anglers were asked about how important berley is for achieving successful fishing, I would put good money on it being at the top of the list of most. 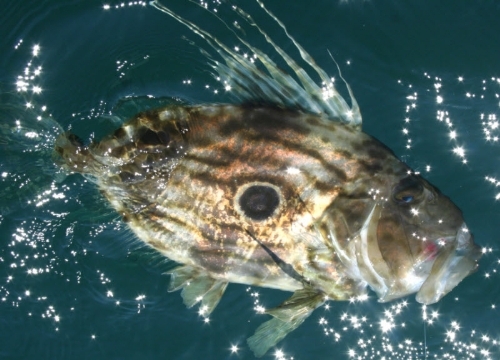 Deploying berley is relatively easy for boat anglers: once placed in the boat, the heavy work is done, with the boat then transporting it to the desired spot. At this point the berley can be dispersed in a variety of ways. Some anglers place it inside a berley pot or netted bag, then tie it to the anchor warp or chain, where it’s left to do its work. The same pot, weighted, can be lowered by cord off the stern to just off the bottom, where the fishy contents waft away down-current to attract fish in towards the baits. Other anglers prefer having a berley bucket with holes in the sides and bottom attached to the stern; just add fish scraps and smash them up with a plunger to get a decent trail going. Or, if relatively little current is present, just tie a mesh bag filled with minced-up berley to the stern. No berley? No worries – just throw regular handfuls of small chopped-up baitfish chunks to get the nearby fish attracted closer and actively feeding. Later, if there are no fish about, it’s easy to simply lift the anchor and motor off somewhere more promising. Just a few minutes under power can make a lot of difference. Land-based anglers fishing from rock platforms have it much tougher. Sometimes a large quantity of frozen berley must be carried for quite some distance, along with all the other necessary fishing gear. Some rock fishers cut down on the berley, but hope to catch a kahawai or two during the session to make it stretch further. Berleying by land-based anglers is commonly achieved by placing a solid lump of frozen fish scraps in an old onion sack, tying a rope to it, then throwing it into the white water close to the rocks where it’s left to do its own thing in the wash. More recently, these relatively easily ripped mesh bags have been replaced by tougher, purpose-made bags, or heavy-duty plastic buckets with holes drilled in the sides and base. Another popular method involves chopping up baitfish into small pieces and then regularly throwing a handful in (one every two or three minutes, say, just like those fishing from boats). Other anglers use a catapult to launch chunks of frozen berley out just a bit further (those plastic hand-held gadgets used by dog owners to throw a tennis ball for their pooch to chase, work well). Shifting from a poorly-performing spot can be a major exercise for land-based anglers. Sometimes the walk in takes an hour or two, so if poor fishing ensues, that usually means success is off the menu for the day. Surfcasters find it even harder to get an effective berley trail going, with the surf zone’s often turbulent waters dispersing the berley particles in all directions – including being washed back up on the beach for the gulls to feast on much of the time! So, just how can a surfcaster take advantage of the benefits offered by a good berley trail? Indeed, how the heck does he even get one going, and what’s the best berley to use? Fear not, fellow practitioners of the noble art, with a little use of the grey matter that resides, largely unused, in my cranial cavity, I have several good answers to those questions, so you can add good berley techniques to your fishing arsenal. The first effective method I came across was the Depth Charge sinker used by Pete Lamb, which helped him win several NZACA Champion Angler titles and was very simple to use. Next, the Depth Charge sinker is dropped in and the berley squashed into the coils from outside the bag – you don’t even get your hands messy. Quite a lot of berley fits into the coils, so you may need to drop down in sinker weight to compensate for the extra mass. After that, simply cast as you would with any other sinker. This method can be devastatingly effective for closer range and calmer waters, with the berley dispersed very close to your bait; the oilier the berley, the more effective it can be. However, there are three significant downsides: one, the Depth Charge sinker is not particularly aerodynamic; two, it lacks the wire grapnels needed to hold in faster current situations; and three, they are hard, if not impossible, to secure now. The completed BOS plus ready for berley. The lightbulb clicked on one day while pondering how to overcome the problems associated with the Depth Charge sinker. For many years I’ve been a diehard fan of BOS sinkers; made aerodynamic for longer casts, with wire grapnels that provide better grip but which fold back for retrieval, they were a prime candidate for a simple modification to become a berley sinker. This saw me winding a length of welding wire around a piece of wooden dowel to make a berley cage that looks like a spring, and placing it down over the BOS sinker’s tail wire. 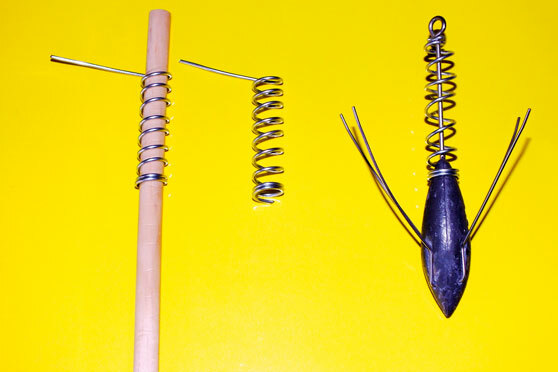 The top end of the spring is crimped around the sinker’s tail wire, just below the eye, to hold it in place. 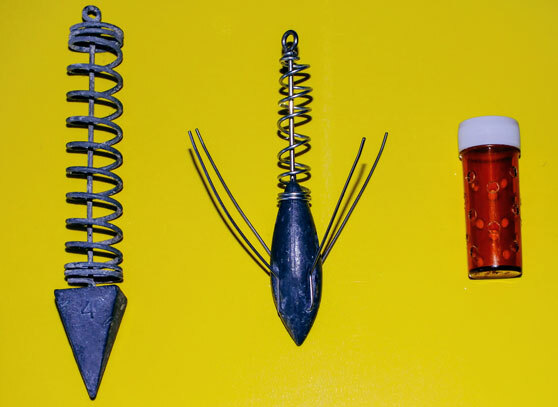 You now have the BOS Sinker Plus, a sinker that does the same job as the Depth Charge sinker, but which is more aerodynamic and has grapnel wires. The berley does add a little extra weight, but not so much you need to drop down in sinker weight. The berley used is similar to that used with the Depth Charge sinker: I still use breadcrumbs and some fish oil, but have reduced the fish bits (unless minced up very finely). Again, the berley’s content will attract the species you wish to catch, so adjust accordingly. Small prescription pill containers are very easily turned into berley-delivery systems. Yes, there are specialised products on the market that do the same thing, but the pill container will cost you next to nothing. Chemist shops periodically get prescriptions back that can’t be used and the containers are discarded; a trip to see your friendly chemist could yield dividends here. First, heat up a piece of wire and burn a small hole in the lid of the container (a heated wire leaves a smoother hole that’s less likely to chafe your line). Next, do the same with the bottom of the pill container, enabling your rig’s line to be passed through these holes. Now you can now drill as many holes in the side of the container as you think you can get away with. Place it on the rig when you make it, but leave enough room so the lid can be removed and the berley pushed into the container. As the berley is a little more protected from the high energy of casting in this case, you can use just about anything you like. I have sometimes used a very sloppy mix and placed it in my bait freezer, rig and all. It quickly thaws out in the water and provides a great oil slick. Whatever you use, once the container is full, screw on the lid and cast out. Years ago, many of us in Hawkes Bay used strips of old pantyhose to wrap around our baits so the crabs couldn’t remove them too quickly. The bait would be placed on the hook as normal, then the pantyhose wrapped around it. Bait-elastic or cotton kept it all together. We found (or, at least, I did) that berley could be added and wrapped up with the bait, with the two held together; I just make sure the hook protrudes well out of the pantyhose before casting.